Receiving a cancer diagnosis is a stressful experience in a person’s life. That stress can increase just from the everyday stress of work and family responsibilities. While stress has not been shown to cause cancer, chronic stress may weaken the immune system, causing other health problems and decreasing feelings of well-being. “Stressors” are any source of stress, good and bad like marriage and divorce; getting or losing your job; moving to a new home; traveling. Some stressors are predictable and, therefore, sometimes avoidable. For 1 in 2 men, and 1 in 3 women, life-threatening cancer is in the future. Many of us will be working at the time of diagnosis, all hoping for a cure and that our lives will be as normal as possible as we go through treatment and strive for that cure. The Johns Hopkins Managing Cancer at Work program can make a difference in the lives of employees facing a cancer diagnosis, or are caring for someone with cancer. Managing Cancer at Work is a low-cost, high-impact employee benefit program that enables organizations to help their employees prevent cancer, recognize the early warning signs of the disease, and understand and manage cancer treatment. This approach keeps employees informed, engaged, and feeling supported. 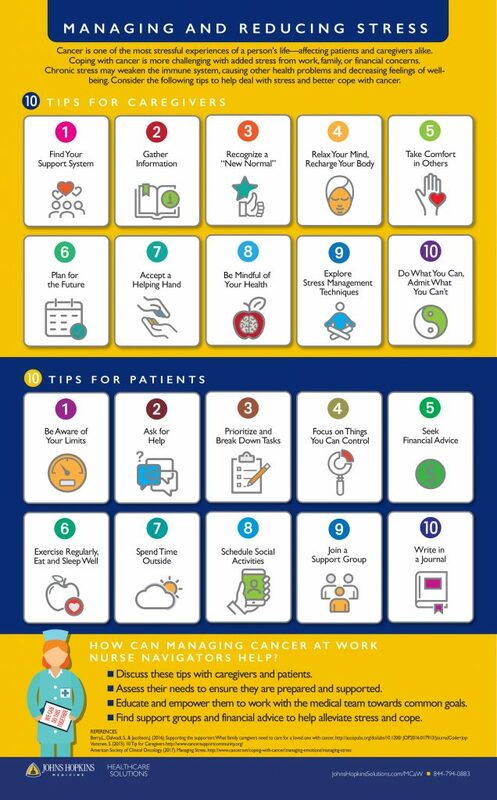 This infographic is just a sample of the helpful information the Managing Cancer at Work program and oncology nurse navigators bring to your employee population. Learn about the Managing Cancer at Work program, and how you can bring it to your organization.